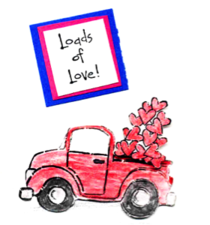 Loads of Love is a special ministry at Saint Andrews UMC that prepares and delivers meals to our shut-ins and others within our church who have been sick, had surgery, or lost a loved one. We also send out about 50 handmade cards each month, including one to each household that receives a meal. We usually meet on the first Monday of the month at 10:00 AM at the church. If the first Monday is a holiday, we gather on the second Monday. All of those who volunteer with Loads of Love are truly blessed, for it gives us an opportunity to share a tangible expression of God's love with our brothers and sisters in Christ. There are many ways our congregation can be involved in this wonderful ministry. If you would like to become involved in Loads of Love, contact the church office at 919-772-4410 or email us at saumcmissions@gmail.com.